Height is just one of the milestones by which we measure our children. We also closely measure our children’s growth via the milestones set out in pamphlets/posters at the doctor’s office, in magazines, child rearing books/websites, etc. We are happy, even proud, if our children meet or exceed the milestones; worried if they don’t. Most of us remember being measured for height at home. 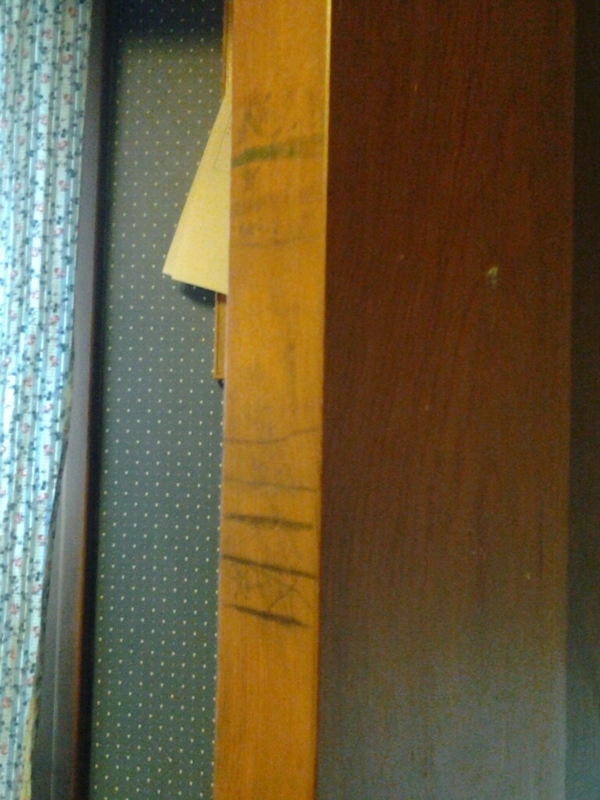 The marks lower on the door belong to Mary and Patty. Will’s marks were higher on the door. He was always tall for his age. Mary was in the 10th percentile for height and weight until she was 12, and then she shot up 12 inches in two years. Which goes to show that you can’t predict future growth by past growth. As a result of this psychological evaluation and the speech evaluation, Mary was placed in a special education classroom. Mary was eventually diagnosed with PDD.NOS (Pervasive Developmental Disorder, Not Otherwise Specified), and her siblings were also given an autistic diagnosis. Their placement in special education also came with many “homework” assignments from the speech therapists, occupational therapists, and social worker/psychologists. In addition to their regular schoolwork, we also had handouts showing exercises to strengthen their bodies, improve gross and fine motor skills, tongue exercises, speech pragmatics, etc. It felt like every minute of their at home time had to be devoted to the effort to help them reach the goals on their IEP reports (Individual Education Plan). The goal was to help them catch up with their peers. Mary – produce /p/ in initial position in words 60% of the time. Will – reply to his teachers’ greetings 80% of the time by the end of the semester. A half hour of Power Rangers was watched every day for several years at our house. Playing Power Rangers served a functional purpose, developing the ability to pretend. Weight lifters and runners need to give their bodies a rest in order to achieve the best results. I think this is true of the mind as well. Work needs to be balanced with fun and vegging out time. This is true of typical children and adults. Why wouldn’t it be true of people with autism, cerebral palsy, or other conditions? Thanks for sharing that link. You make an excellent point. In our haste to “catch up” we sometimes don’t appreciate the benefits some down time can offer. Down time also helps us gain strength for the journey and helps develop patience with both ourselves and our children.